Dadonghai Beach (Great East Sea), Dadonghai Beach Travel, Dadonghai Beach Pictures, Sanya, Hainan Island, China. Dadonghai, which means Great East Sea, bears the connotation of °Fortune lasts as vast and deep as East Sea", spreads in-between two peninsulas, it is an open complimentary location to the public. 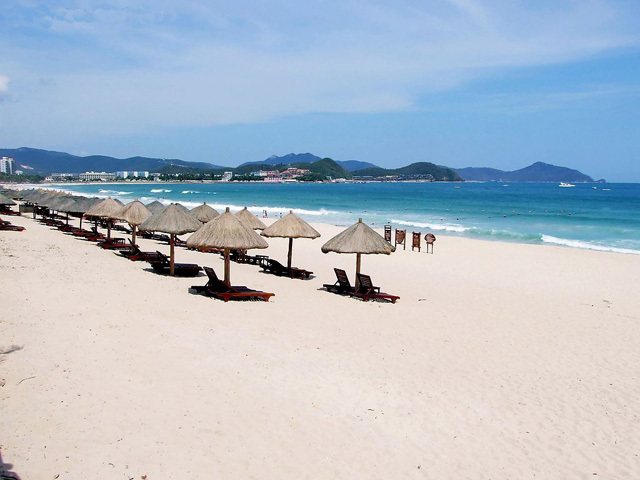 It is the earliest open beach for tourists in Sanya and still popular in Sanya. Dadonghai is a crescent-shaped beach, 2.3 kilometers long (about 1.4 miles), with clear blue sea, sunshine, white sand and green trees to create an amazing torrid scenery. Panoramic view of the Dadonghai Beach. Dadonghai Beach. The famous beach is ideal for beach sports, bathing and sunbathing. It has everything to support a seaside tourist location, including a large shopping square Summer Mall on the shore, amusement companies and a famous dive company that can provide scuba diving, ship diving, seabed strolling, speed boat, motorboat, luxury yacht, sail boat, ocean fishing, beach sports and underwater photography. 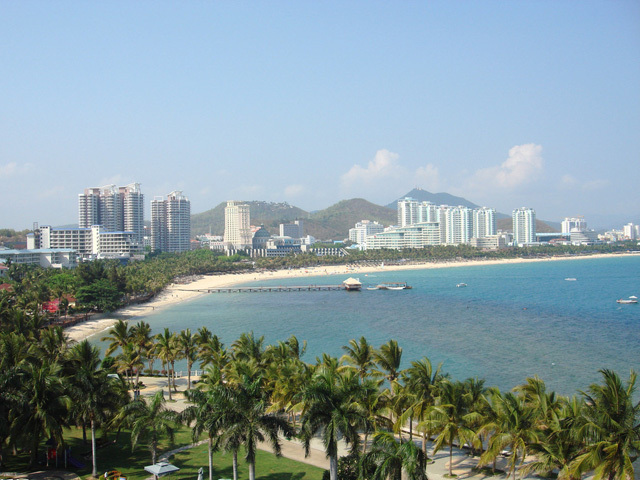 This location is renowned for water activities in Sanya and throughout China. Dadonghai Square and Outdoor Seafood Barbecue Square are all able to offer leisure for tourists, such as beach bars, seafood, barbecue and etc. Dadonghai is the earliest winter hideaway of China as well as a top destination for underwater sightseeing, seawater bath and sunbath. Dadonghai was awarded the Golden Cup Prize by French Tourism Committee in 1993, and is rated as one of China's top 40 tourist attractions by the National Tourism Bureau. Simply it is a "must-see" destination for visitors to Sanya.